This event has already proceeded. 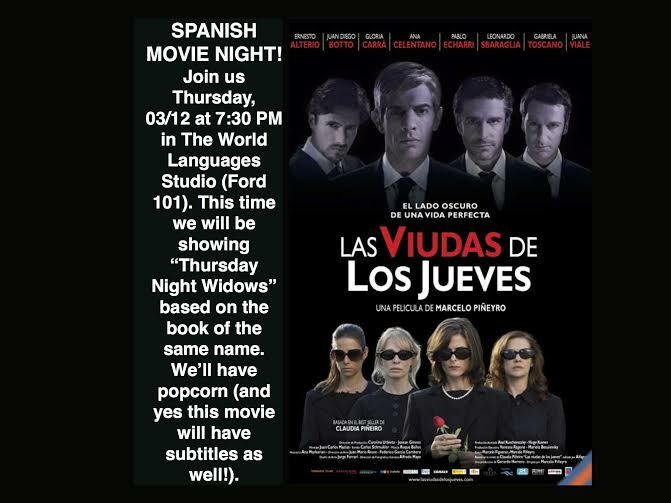 The Spanish Department, Spanish liaison, Spanish club & WLS would like to invite you to watch Las Viudas De Los Jueves” (Thursday Night Widows). In this movie, families who live in a gated community in Argentina show us how the 2001 economic and political crisis in led them to take drastic measures in order to continue to belong to the wealthy, upper class. It will be shown once again in the World Languages Studio (Ford 101) on 03/12 at 7:30pm as per usual.